Ever had that embarrassing moment when you’ve proof read and checked a really important email 20 trillion times only to click send and spot a typo the second after you click send? 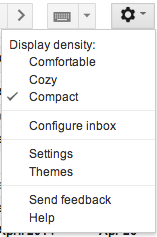 Thankfully Gmail Labs has just the feature to save you from embarrassment. Click “Enable” and make sure to click “save changes” at the end of the page. You now have an “Undo” button for your sent emails. Basically Gmail will now wait for a few seconds before actually sending your email – giving you the opportunity to undo and quickly fix that typo or attach that document you forgot to send. Absolute lifesaver – thank you Google!